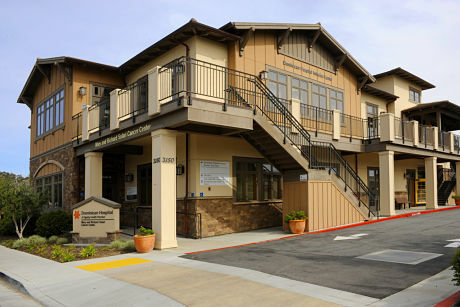 Dominican Hospital is the only hospital offering oncology services—and the largest provider of cancer services to indigent Medi-Cal patients—in Santa Cruz County. The Mary and Richard Solari Cancer Center accepts all patients regardless of financial situation or insurance status and includes support services provided by the Katz Cancer Resource Center, an Infusion Center in a new soothing environment outside of the hospital, strong in-patient cancer care, and a wide spectrum of specialty programs. Dominican Hospital maintains the highest cancer care accreditation possible for a non-academic medical center: it is designated as a Comprehensive Community Cancer Program from the American College of Surgeons’ Commission on Cancer (CoC). Funding for our Cancer Care programs was provided through generous donations from many community members with major support from Mary Solari, California Grill and the Peixoto Family, Don Jackson, and Santa Cruz Cancer Benefit Group. The Foundation is raising funds to train additional physical therapists and home health care workers in order to have an even more comprehensive program. To support these efforts, please call Dominican Hospital Foundation at 831.462.7712. We are pleased to provide this funding that will improve access to care by reducing the financial barriers for cancer patients. This will, in turn, reduce their stress as they go through the difficult challenges and treatments needed for their recovery. Launched by Dr. Steven Plager with a significant gift from Bennet and Suzy Katz and numerous community donations,the Katz Cancer Resource Center serves those affected by cancer with personalized programs, education, and support groups. I found that with both of my parents, once you’ve been diagnosedwith cancer, you just can’t think beyond the disease. You just don’t know where to turn. I really could have used the support of a cancer resource center. Life has been good to us and cancer has deeply affected our lives, so we wanted to make this donation. Don Jackson, a Foundation Board Member, established the Sydney Jackson Patient Support Endowment in memory of his wife. The fund provides critical support services for patients in emergency needs. I give Sydney the credit for the idea. While at Dominican, she was so impressed with the treatment she received from Dr. Jaffe and the entire staff at the Cancer Center that she wanted to do something that would sustain their mission. Dominican’s Solari Center includes the Katz Cancer Resource Center, providing support services for cancer patients going through treatment. Now Katz is also launching a comprehensive program aimed at improving the quality of life for cancer survivors. Cancer patients often suffer with a loss of or decrease in mobility, strength, muscle mass, and ability to focus. If an individual is injured, physical and occupational therapy is frequently recommended. However, when a cancer patient has completed treatment, he or she is likely may not report impairments and miss the opportunity for therapy. "Cancer treatment is often provided in isolation from other care, even though cancer patients often have multiple comorbidities and health care needs," says Dr. Alexander. "The survivorship plan is a vehicle that will help patients with communication and coordination of care, addressing issues, transition care, and promote a healthy lifestyle to prevent recurrence and reduce the risk for comorbid conditions." The Survivorship program includes psychosocial, rehabilitative, and nutritional components. The Cancer Center has begun the certification process for the STAR (Survivorship Training and Rehab) program through Oncology Rehab Partners. A team of physical, speech, and occupational therapists, oncology nurses, social workers, and dietitians at Dominican, completed 25 hours of specialized training on oncology rehabilitation. The goal of the STAR program is to provide a continuum of care with rehabilitative elements that will help patients improve their quality of life, cognitive functions, ability to enjoy their life, families and remain productive members of society. Recently the Cancer Center has opened its doors to the very first Survivorship Program patient. The Katz Cancer Resource Center team anticipates helping 200 people or 20-40% of Dominican oncology patients a year with the program. All cancer patients at Dominican will be pro actively screened to see if they would benefit from this program. Diagnosing cancer early can often prove to be the difference between life and death. Given that lung cancer is the leading cause of cancer death in the U.S. – in part because it is often not diagnosed until it has reached an advanced stage – early detection becomes even more critical. Since initiation of this program, 233 persons have been screened in Santa Cruz with findings of 3 cancers all of which were in Stage I, the most curable stage. Dominican Hospital and the Radiology Medical Group have reduced the cost of a yearly scan to only $199 to ensure that these scans are accessible to all. If a patient cannot afford the cost, donated funds for this preventive screening are available from the Dominican Hospital Foundation. Dr. Alexander and his wife Toby were one of the first to make a gift to this program. Let’s get together to talk more about our community’s needs and how, together, we can bring the best cancer care to Santa Cruz County. For more information, please contact us at (831) 462-7712 or givingtodominican@dignityhealth.org. Itis my sincere desire that my gift will transform the cancer patient experiences and offer hope to individuals and their families who are dealing with this challenging condition.